The brain is not lazy it’s a survival mechanism. Brandt and Berge both explain a lot of human (marketing related) behavior with the core message: “The brain is lazy”. Although the brains ability to ignore information is an important feature, it doesn’t explain all marketing related scenarios, and it doesn’t explain WHY it is lazy. “In the choice between changing one’s mind and proving there’s no need to do so, most people get busy on the proof”. If the brain is lazy, then why is it extreme at detecting minute changes in everything from graphic detail, objects in motion in the distance or unexpected outcomes of events? Looking at a lot of references we can see that the brain doesn’t relax in order to not get “overheated”, it relaxes in order to conserve energy in case something unexpected happens. 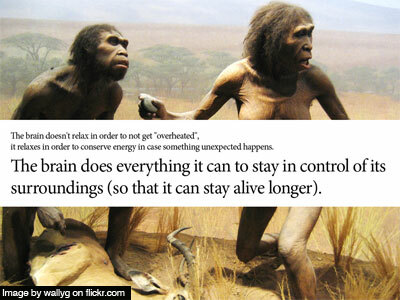 The brain does everything it can to stay in control of its surroundings (so that it can stay alive longer). Gladwell writes in his book Blink about our ability to “shut of” some senses in extreme situations in order to concentrate all our energy on the important ones. His example is of police officers remembering seeing the trajectory of the bullet they fired, but can’t remember any sound. Chip and Dan Heath writes in their book Made to Stick about how humans react when they are surprised, eyebrows lift in order to open the eyes to the maximum for larger vision, at the same time the jaw drops, and mouth opens so that no processing is needed to maintain that function. The dog often does everything it can to avoid trouble (often misunderstood by humans because of difference in sign systems). In order to avoid a fight it barks to say “stay of my territory” and it goes to a great length to show submission. We naturally reject change as it will force us to use energy in order to redefine our present stand. On the other hand we look up to risk takers and embrace novelty, the reason being Darwinism. In order to survive we know that it is the species more adaptable by change that will survive. Therefore, even though most people are focused on just remaining in the status quo, we admire and adore risk averse people, as they are the ones who will take the species forward. According to Gilbert the brain wants to exceed control, not for anything other than control itself. People who are given control are better of, people who loose control are worse of than not having had control at all. Instinctively we want to figure out how things work, in order to predict its outcome (Godin). Children can watch the same TV-programs over and over again – because they want to be able to accurately predict what is going to happen. Adults are the same, if we are exposed to something new, we try to figure it out in order to being able to aanticipate it’s outcome. The brain uses a lot of energy when something disrupts the existing “real”. But, every time the puzzling is disrupted by unexpected pieces, the brain turns on it’s attention in order to understand, and create a new predictable schema. My statement is that although the brain often acts as lazy, the reason for this is that it conserves energy when it can in order to have the reserves available when something new or unexpected happens – so that it can invest in figuring it out, predicting and controlling it – which it does to a great extent. Previous Post The future of the web is browserless.